"Yes or no, what's it gonna be?" ...is the line Lenny Starkweather asks his friend Cal Ryder to come with him on a road trip to Mexico for cheap thrills. The problem is, Cal's going to have to do some things that are a bit... risky. 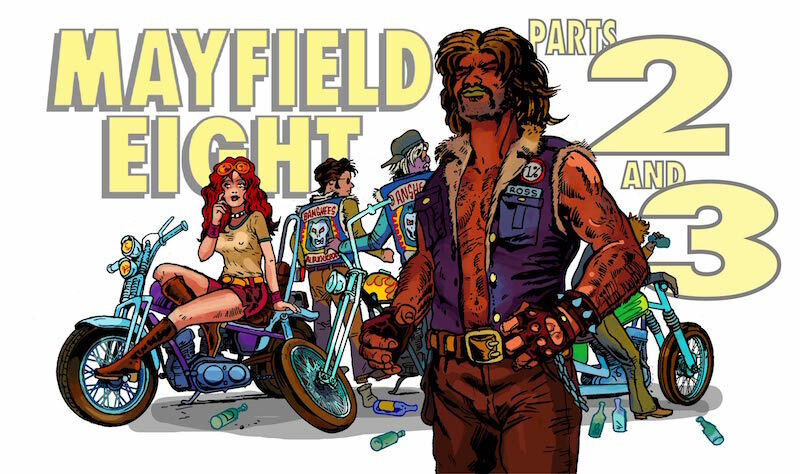 My comic book Mayfield Eight is now live on Kickstarter. The long-awaited 2nd Kickstarter installment that went on last May. A continuation of a story set in 1974 Southwest US. Cal Ryder is a 17 year old fry cook with a dull future and bored outlook. That instantly changes for him as he gets in trouble with the local Biker Gang known as The Banshees. Pledge levels begin at just $9 and include pin ups and stickers... all the way up to the chance to use me as YOUR artist for your next project! In addition, I'm rolling out a series of Comic Strips set in the world of 'Mayfield Eight'. the first few will be open to the public, then switching over to a 'subscriber' list basis. Please visit my Kickstarter page and see if this is the comic for you (there's also an awesome video). If you like a wild and gory tale with tons of violence and its share of sexual tension set in the thick belt, bell-bottomed, custom van, shag carpet, mutton-chop sideburn, 'Have a Nice Day' that was the 1970s then this is the comic for you!